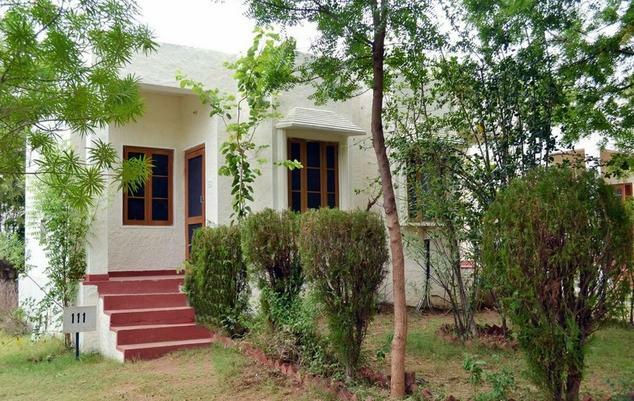 Tiger Machan Resort Ranthambore is a three star hotel that is situated near Sawai Madhopur Junction and the Ranthambore National Park is just 5 minutes drive from the resort. 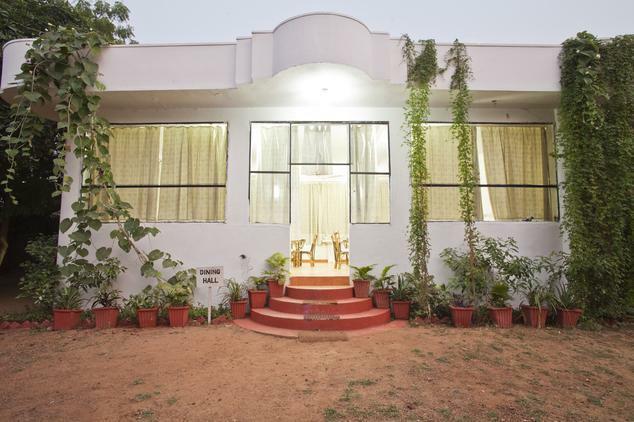 The resort is situated in the foothills of Aravalli Mountains and is set amidst the nature. Just behind the resort is the reserved forest which will be an ideal place for naturalist, birdwatcher and for those who wish to spend in Indian Jungle. You can also take a nature walk along with our experienced guides during which you might find the pugmarks of tiger, leopard, etc and might see some animals like chithal, sambhar, wild boar, etc. For the guests, the resort offers three kinds of accommodation namely Machan or Super Luxury Tents, Luxury Tents and Rooms. The resort also has a multi-cuisine restaurant to provide the guests with culinary delights. 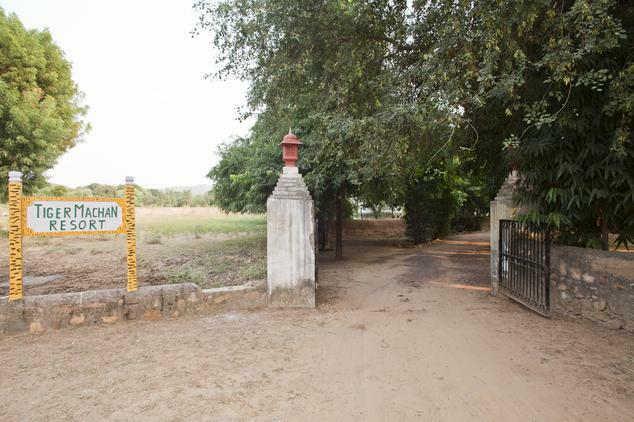 The hotel arranges for nature guides, camp fire, nature walks, village trips, jungle jeep safari, ayurvedic massage on request and canter safari. The resort also has power back up and swimming pool. It also arranges for sightseeing trips. The hotel is ideal for the leisure traveler. 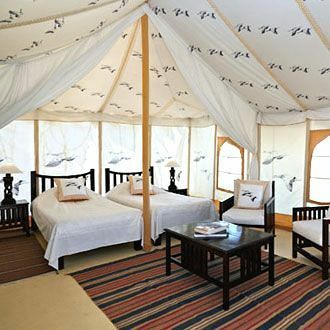 These are more spacious and luxurious tents that come with a living area, bedroom, dressing area and a private veranda. 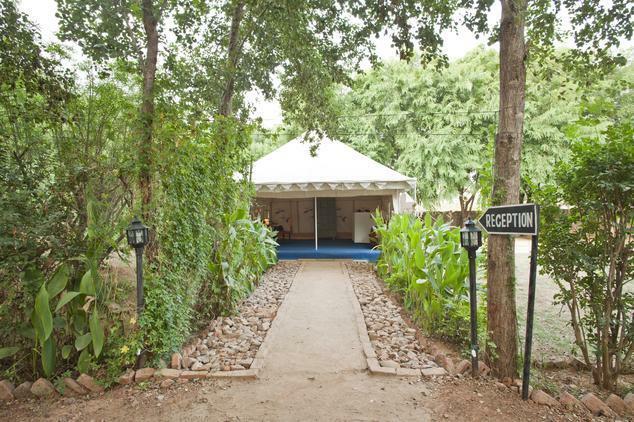 The tents and furniture are designed based on bygone era. The tents also come with amenities like large queen sized bed, attached bathroom with 24 hrs hot/cold water, toiletries, 24 hrs room service, hair dryer, housekeeping, laundry/dry cleaning, tea/coffee maker, air conditioner, telephone with STD/ISD, safe deposit lockers, television with satellite connection, internet, doctor on call, parking and many other facilities to make the stay of the guests comfortable. These are ideal for those who like to watch the animals. 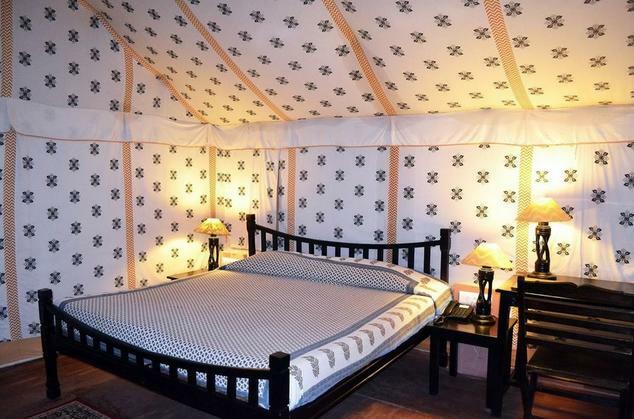 These are luxurious, spacious and well furnished tents. 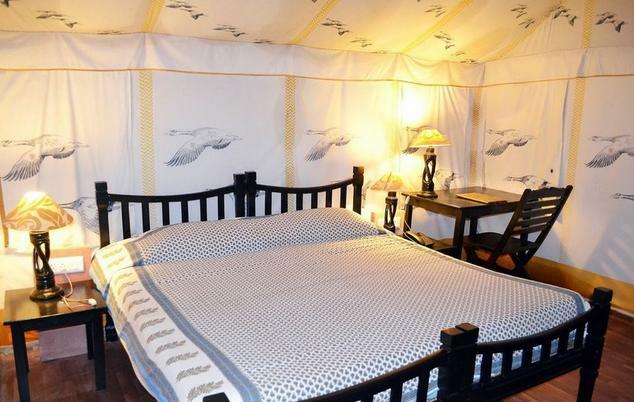 These tents come with a separate living room, a lovely bedroom, a large bathroom, dressing area and also a private veranda. These rooms are elegantly designed and furnished according to the bygone era. 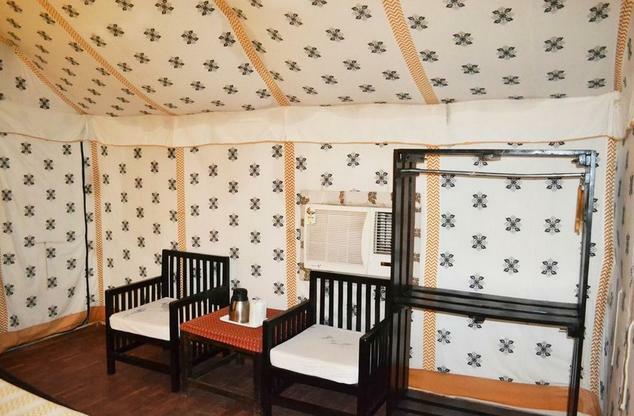 Other than this, these tents are provided with amenities such as air conditioner, attached bathroom with 24 hrs hot/cold water, large queen sized bed, 24 hrs room service, toiletries, housekeeping, hair dryer, tea/coffee maker, laundry/dry cleaning, safe deposit lockers, telephone with STD/ISD, internet, television with satellite connection, parking, doctor on call and all other amenities which will make the stay of the guests memorable. These are two separate bungalows that consist of four bedrooms. These could be availed as either individual rooms or for small group to hire it as a whole. All these rooms are elegant, well adorned, spacious, luxurious and well furnished. Further, these rooms are provided with amenities such as attached bathroom with 24 hrs hot/cold water, air conditioner, 24 hrs room service, large queen sized bed, housekeeping, toiletries, tea/coffee maker, hair dryer, safe deposit lockers, laundry/dry cleaning, internet, doctor on call, telephone with STD/ISD, parking, television with satellite connection, etc. It is ensured by the hotel staff that each and every requirement of the guest is taken care of and their stay is made memorable. The 24 hrs delectable on-site multi-cuisine restaurant serves Indian, Chinese and Continental veg and non-veg food. The guests can dine in open air garden restaurant or covered restaurant or in their room itself. 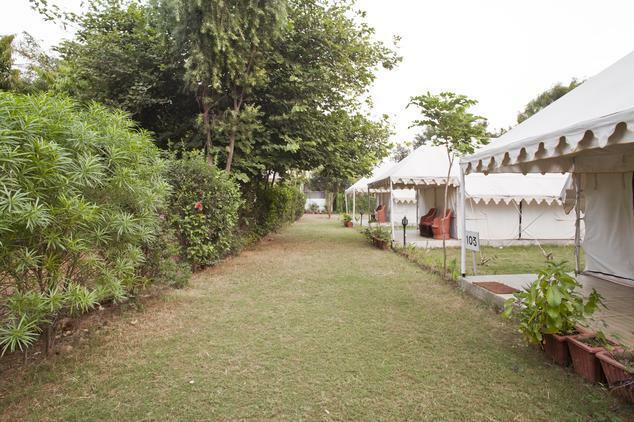 All the vegetables and fruits needed are grown in the resort itself in organic manner. Though the dining area is ideal for breakfasts as well as lunches, for dinners it is mostly served in the open air and also around a bon-fire (if the guest wishes so). The guests are also provided with live entertainment of local dance and music by the local musician. The resort has aamla trees and guests can take the fresh juice of aamla while leaving. Each and every culinary needs of the guest are taken care by the restaurant staff and are provided with sumptuous as well as delicious food. Don’t miss out on Rajasthani delicacies including the “Dal Bati Churma”.